This is a small drying harbour situated at the mouth of the River Axe, formed behind a large shingle bank, giving access to shallow draught yachts & craft at high water. The entrance is located beneath Haven Cliff and is open to the prevailing south westerlies. It is narrow (approx. 10m) and formed between the shingle spit to the west and a short stone / concrete / wooden piled pier to the east. The River Axe estuary extends some two miles inland and is navigable at high water by small craft. The tidal streams run strongly in the entrance, especially during springs or when the river is in spate. There is a shingle bar off the entrance, which is liable to frequent change, altering the direction of the entrance channel. Maintaining the harbour entrance is totally dependent upon the volume of water entering and leaving the estuary. The scouring effect, especially during the ebb flow helps maintain the entrance clear of shingle. The scouring effect is greatest during spring tides and less effective during neaps. Similarly the build-up of the shingle bar is more evident during neap tides due to the decreased flow, spring tides tend to scour the bar and widen the entrance channel. In providing these notes the Axe Yacht Club cannot be held liable in any way or form where circumstances have changed from those described. Each vessel will have its own capabilities and limitations which need to be carefully considered in conjunction with these notes to ensure safe navigation. A prudent navigator will have taken into account all prevailing conditions to assess the safe execution of his intended passage before proceeding. Part 1. is designed for yachtsmen entering from seaward, without prior knowledge of the harbour. Part 2. is aimed towards local harbour users. Approach - The approach should be made only in daylight and in settled conditions. The entrance can be dangerous in anything more than a moderate onshore wind without local knowledge. Due to the strength of the tidal streams in the entrance, entry should be made within half an hour either side of local high water, so as to gain slack water. 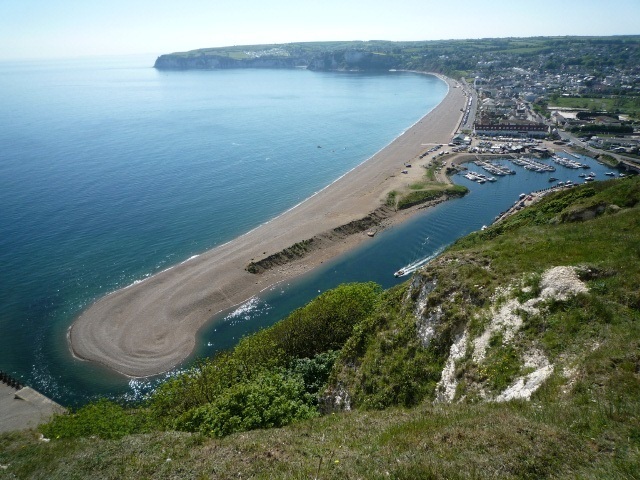 The entrance is located beneath Haven Cliff at the eastern extremity of Seaton Bay. There are no offshore dangers in the approach. At low water the old pier head rocks uncover approximately 20 metres to the west of the entrance and the River Ledge rocks uncover 30 metres to the east. Tidal Streams - Local High Water is 4 hours 55 minutes before HW Dover. The tidal streams off the entrance and the adjacent coastline are rectilinear and generally weak, attaining 1.5 knots during springs and one knot during neaps. The east going stream starts approximately four hours after HW Dover, until two hours before, at which time it eases and turns to the west until four hours after HW Dover. Conversely the tidal streams in the entrance run strongly, requiring great caution. Tidal streams in the entrance are usually stronger during the ebb, attaining six knots during springs, and increase considerably more after heavy rain. The flood tide can attain speeds of 5 knots. For this reason it is necessary to enter as near to local high water as possible. The ebb flow from the harbour entrance sets up overfalls on the bar and immediately seaward of it; this occurs from approximately one hour after HW until LW. Anchorage - In settled conditions it is possible to anchor due south of the AYC club house (white building with grey slate roof & white mast) in approximately 5m of water, with a sand bottom and reasonably good holding. A more sheltered anchorage can be found off the village of Beer, although remains open to the South and East. Due to poor holding and limited room, there is no anchorage within the harbour. Approach & Entrance Channel - The entrance channel usually runs from the pier head in a SW'ly direction (but as stated is liable to change) with shingle drying each side extending approximately 75m. (LAT) seaward. The approximate line of approach is when the 'pillbox', situated beneath the cliff, is in transit with the pier head, providing a NE'ly heading. On making the approach due allowance should be made for the east going coastal tidal stream. Once inside the entrance there is a sharp turn to the west following the line of the harbour wall. A mooring basin with pontoons is situated just below the fixed bridge to port. Fishing vessels berth to starboard against the quay, all berths in the harbour dry out. Depths - MHWS depths within the entrance channel are 3.3m decreasing to 2.5m within the harbour and 2.8m to 1.6m MHWN respectively. The shingle bar and entrance dry to 0.5m, shallowing within the harbour, drying to 1.5m, although there is approximately 0.5m impounded in the mooring basin. Accommodation and Facilities - The Axe Yacht Club provides approximately 120 pontoon berths, with a limit of 9.0m LOA and 1m draught, capable of drying out. Visitors berths are available upon application to the AYC Bosun. The mooring basin is fairly well sheltered, there being little swell entering the harbour. Store, Fuel, Repairs - Water can be obtained from the Yacht Club. Fuel & stores can be obtained from the local super market in Seaton (half a mile distant). Local chandlery is available in Beer. Two local hostelries exist in the village of Axmouth and a mixture of facilities in Seaton. Repairs can be carried out by the local boat builder, H.J.Mears; situated just above the bridge (clearance of l.5m HWS). The estuary can be navigated some two miles inland by shallow draught vessels at HW. When planning to go to sea it is recommended that the entrance is viewed from the shore. This will provide the prudent harbour user with an appreciation of the general sea state, conditions on the bar and within the entrance. Navigation of Axmouth Harbour is very much reliant on the sea state and height of tide, consideration of both is essential for safe navigation. The harbour dries to approximately l.5m, a rock bed sill known as the "Rapids" situated just below the Harbour Houses, maintains a certain amount of water within the harbour at all times; the sill is the shallowest part when navigating the harbour channel. On departing the mooring basin, a course should be set towards the lower quayside buttress just below the Harbour Houses. From the buttress maintain a course parallel to the harbour wall approximately 5 metres off, this will avoid the shallows (Rapids) to starboard. Once clear of the Rapids there is usually sufficient water in the entrance and the outside approach channel. Vessels with draughts up to 0.8m (2' 6") can usually clear the Rapids two and a half hours before Local High Water (HW), obviously the shallower the draught, the earlier one can leave. During springs, the flood tidal stream can run upwards to five knots, the maximum flood runs for a period between two hours and half an hour before HW. The ebb runs stronger especially after heavy rain maintaining a maximum rate from one hour after HW until the harbour effectively dries out. When proceeding to sea against the flood, low powered vessels are advised to make the harbour entrance either during the period two/three hours before HW or around the HW period. Re-entering the harbour during springs should be no later than one hour after HW, to avoid the building strength of the ebb flow. Vessels entering or leaving the harbour with the direction of flow should take great care especially in the entrance, where the stream tends to set towards the harbour wall and pier. When entering the harbour sufficient allowance should be made for the east going tidal stream, which can set a vessel towards the pier. During neaps the tidal streams are much weaker enabling vessels to enter or leave between three hours before and two hours after HW (dependent on draught & sea state). However caution should be exercised due to the shallower depths and build-up of the bar during neaps. All of the foregoing is dependent on prevailing sea conditions. The approach and entrance can be dangerous with moderate to strong onshore winds, causing seas to break heavily on the bar. Such conditions are worse with the ebb tide opposing an onshore wind; this creates a dangerous wind over tide situation with overfalls. During such conditions the harbour entrance should be avoided. There is a five knot speed limit in the harbour, including the approaches and estuary. Vessels navigating against the tidal stream have greater manoeuvrability and should give way to those navigating with the stream, especially in the entrance. Due to limited vision on the approach to the entrance from within or seaward, vessels should navigate with caution and avoid overtaking in the approaches and entrance to the harbour. Vessels should take care to make sufficient allowance when navigating within the harbour, especially during spring tides to avoid being set onto moored craft, pontoons or the bridge. The AYC maintains a web-cam positioned on Haven Cliff from which the harbour entrance and bar can be viewed. It is set up so that it records photos of the entrance every 20 minutes, these can viewed over the previous low water period to gain an appreciation of the bar and entrance channel direction. On occasions where the bar forms a constricting approach channel, either to the east or to the west, caution should be exercised to avoid being set onto the foreshore. Due to this, vessels returning to the harbour after an extended period should aim to arrive at HW to ensure maximum depth of water, especially if the position of the bar is uncertain. In this particular case the webcam provides a valuable pictorial reference. In providing the Haven Cliff webcam the Axe Yacht Club aims to assist those navigating the harbour entrance, however the Club can not be held responsible for any reliability issues (ie, information displayed is up to date) when viewing the webcam. A review of prevailing sea conditions, tides and weather forecasts is essential in order to make a proper and safe assessment before proceeding to sea or entering from seaward.